Imagination Technologies will deliver its first Warrior CPU core to device makers by the end of the year, beginning a campaign to make the MIPS architecture a more potent rival to ARM and x86. Imagination's graphics chips are already used in most of the top smartphones and tablets, including the iPhone and iPad, and last year it bought MIPS Technologies to try to build a CPU business as well. 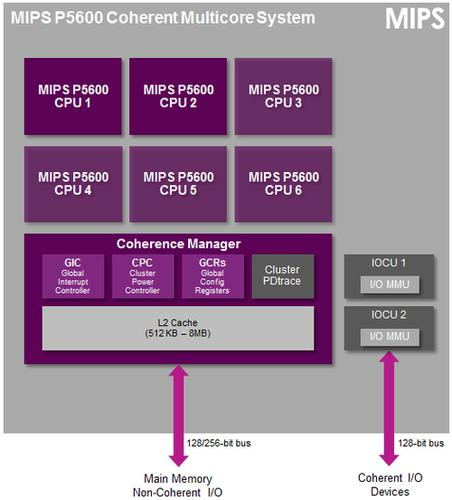 MIPS chips are widely used in network gear such as routers and gateways, and in home media products including TVs and set-top boxes. Imagination wants to bring them to low-power servers as well, and to a wider range of Android smartphones and tablets. The Warrior chips, also called MIPS Series 5, are part of its effort to do that. The first product, the MIPS P5600, is a 32-bit design that will be offered with as many as six cores and a clock speed of 2GHz or more, Imagination said Monday. It provides up to twice the performance of the current proAptiv MIPS chips at the same clock speed and manufacturing process, the company said. Imagination doesn't manufacture chips itself. Like ARM, it comes up with the designs and licenses them to other chip makers. The P5600 will be available for licensing in the current quarter, Imagination said, which means it should appear in consumer products in about 18 months. Improvements include the ability to handle 128-bit SIMD, which allows more instructions to be run in parallel, improving performance in areas such as video and audio playback, said Mark Throndson, Imagination's director of processor technology marketing. It's also the first MIPS CPU design to get hardware virtualization capabilities, he said. That should improve security, because multiple operating systems will be able to run on a single core without those data sets being able to interact. That should be useful for set-top boxes that have to handle security schemes for multiple services, such Hulu, Amazon and Netflix. It could also be useful for banking apps that handle sensitive data, for example. Despite being a 32-bit chip, the P5600 provides a wider data address space of 40 bits, Throndson said. That will allow it to address more memory than existing 32-bit MIPS processors do. Paul Teich, an industry analyst with Moor Insights & Strategy, said the CPU design is an important first step for Imagination. "It's good to see them doing it, because it means they're locking down their road map and executing," he said. MIPS Technologies was struggling financially when Imagination bought it, and one of Imagination's first tasks is to convince MIPS customers that the architecture has a good future. But Teich thinks "the real meat" will come with future Warrior announcements. The company has said it will release further Warrior designs next year, including the first 64-bit Warrior CPU. The type of smartphones MIPS chips are used in today don't really need the 40-bit address space, he said, and the hardware virtualization will be more useful when a 64-bit chip arrives. "They can start to use it with network gear now, but frankly, with Intel and AMD already at 64 bits for their small-core architectures, and ARM moving to 64 bits shortly, I see that as more of a forward-looking story for them."